The Waterlooplein is not old by Amsterdam standards. Yet it is in the middle of a neighborhood whose history dates back to the Middle Ages, but the Waterlooplein was not yet available at that time. This name was officially only established on the 16th December 1883. The council decision of that day does not state the reasons for that decision, but it is plausible that the city council wanted to pay a tribute to the heroes of the battlefield by this naming, where Napoleon was given the final blow. The question is obvious what happened before Waterlooplein became Waterlooplein. The answer is as Amsterdam as it can be: water. In a less formal sense, the square is of course very old. Vlooyenburg or Vloonburg was called the piece of land, which lay just outside the original medieval and walled city, on the north bank of the Amstel, which still bends to the west with a playful curve and formerly via Rokin and Damrak its way to the IJ continued. The fleas from that name have nothing to do with the annoying insects of then and now and even less with the flea market that came later, a name by the way, which people of Amsterdam hardly use. Vlooyenburg was continually flooded by the water of the Amstel. Vlooyen is just flowing, nothing else. That would come to an end when in 1593 it was decided to expand the medieval city. The previously unoccupied piece of land became a neat square island, surrounded by the Amstel, the Verwersgraft now Zwanenburgwal, the Houtgracht and the Leprozengracht. The square was created when the Leprozengracht in 1882 and the Houtgracht were filled up. The photo below shows the situation in 1880. The canal in the foreground is the Leprozengracht. The canal that runs from the left along the church is the Houtgracht. The Waterlooplein market became a daily market in 1885, six days a week, of course closed on Saturdays. This Waterlooplein flourished as a market where really everything was for sale. 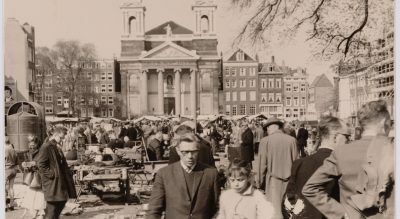 The real Jewish Waterlooplein market with the Jewish persecution disappeared in 1941 for good. The market has recovered after the war, but has never become like the one before the war. In the beginning of 1941 there was a conviction that all Jews had to register. There were signs with “forbidden Jews” and signs with “Jewish Quarter”. This condemnation aroused much anger. 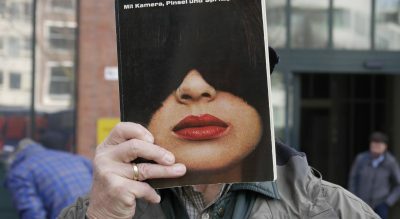 In the illegal magazines a strong position was taken against this. The way in which the WA (a department of the NSB) maintained this conviction went beyond all limits. In the “Jewish corner” windows were smashed, there was a lot of vandalism and people were maltreated by the WA. On 10 February it came to a confrontation between the WA and the Jewish thugs. After this, the Jewish quarter was completely sealed off. On February 22, 425 Jewish men were arrested in retaliation and taken to the Mauthausen death camp. This was the reason for the great and massive “February strike” a grand protest of the Amsterdam population against these atrocities. This is commemorated annually at the statue of the Docker. After the war, the gruesome truth about the extermination camps was publicly known. The Jewish quarter (the Jewish corner) was empty, the houses that had been evacuated by the German occupiers had been looted, demolished or burned in the cold winter of 1944. And of the Jewish population only a bitter minor part has returned. They were gone, those traders, the street trade, the crowds. It had become quiet in the neighborhood. With the reconstruction law of 1950, a start has been made to make this neighborhood habitable again. It would take many years before the neighborhood was given a habitable appearance again, the Nieuwmarkt trolleys, the resistance against the construction of the metro and the construction of the town hall caused a lot of turmoil. 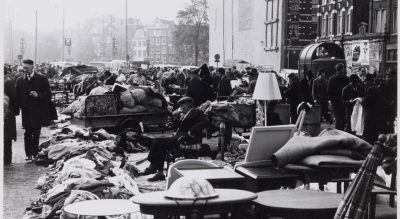 After the war there was a shortage in Amsterdam, the flea market brought the solution, especially surplus army supplies were abundant and were sold for a small price. In the 1950s, the economy improved, old furniture was replaced by modern items. Everyone wanted to have such a hip, modern wall unit instead of the oak sideboard. Discarded household effects ended up at Waterlooplein. 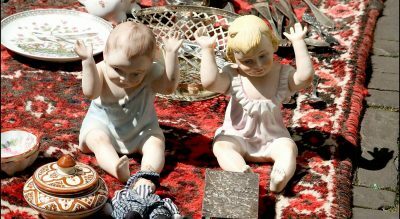 Hippies, Flowerpower and wealthy American tourists made the market famous in the Netherlands and abroad in the 60s and 70s, often compared with Le Marché aux Puces in Paris (which is now regulated so that hardly any there is a flea market with merchandise displayed on the ground).